Santa Monica is located only eight non-freeway miles (13km) from Los Angeles International Airport (LAX), Santa Monica provides easy lift from most major metropolitan areas. 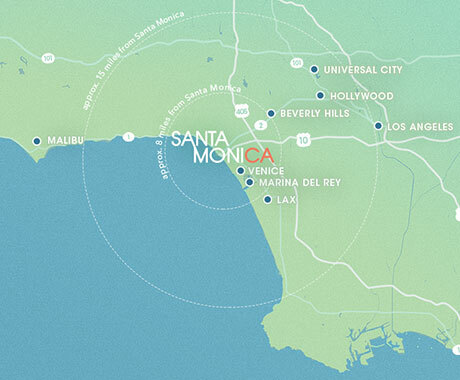 Santa Monica's 40 hotels, 400+ restaurants and 100,000+ square feet of unique event space are all located within eight square miles, creating a truly accessible and pedestrian-friendly destination. Visitors also enjoy the city’s prime location within greater Los Angeles, which allows for easy day trips to all of Los Angeles’ venues most famous landmarks and attractions. 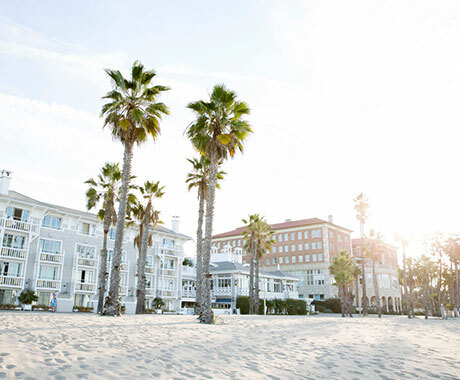 Santa Monica is a walkable seaside city with plenty of public transportation options and easy access to greater Los Angeles and Southern California destinations. The city offers a number of convenient transportation methods including the Metro Expo Line connecting Downtown Los Angeles to Santa Monica, Big Blue Bus, Breeze Bike Share Program and Santa Monica Free Ride Shuttle. Whether it's a guided tour through one of Santa Monica's four weekly farmers markets with one of our destination's top chefs or a fun comedy improvisation class focusing on your attendees, let our team help you plan a distinctive team building experience for your group. Santa Monica has over 400 restaurants, from casual to elegant, offering award-winning, world-renowned dining. There are plenty of options for group dining with a/v and for catering your meeting. From its early days as a global center for aviation to the city’s high-tech emergence as "Silicon Beach," Santa Monica has always been ahead of its time. The city’s blend of urban sophistication and natural beauty attracts artists and innovators eager to break new ground in pursuit of their visions. Santa Monica has a wide variety of attractions, activities and entertainment options including bike tours, riding the world famous solar-powered Pacific Wheel and a wide array of shopping districts. Experience some of these activities through virtual reality.